Death is permanent and, in all works of fiction, predetermined. Except in video games, where most of the time it is neither. Niko Bellic probably never felt so bad as when, hours after resolving to abstain from a lifestyle of crime and extreme violence, his would-be girlfriend/chance at a more fulfilling existence Kate McReary is gunned down in a mafia drive-by. As Niko emphasizes loudly and often to her killers, Kate never did anything to hurt anyone. Where's the meaning in her death? What's Niko Bellic to do but exact revenge and move on? 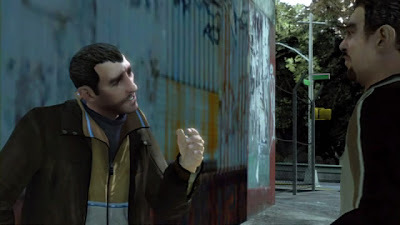 Then again, Grand Theft Auto IV being a video game, Niko could also send himself back in time to try and prevent Kate's death. He does this -- or you, the player do it -- by reloading a save game, erasing recent events so you can reevaluate your options and pursue the optimal outcome with mechanical efficiency. Niko knows what death is. He's died a hundred times in the last 50 hours, and after each death he is resurrected outside a nearby hospital. How can death have any meaning when it's so trivial and reversible? Niko doesn't have time to consider the theological implications, though, because he's trying to save a girlfriend. Kate's death traces back to a decision made at a narrative intersection. Take Mission B over Mission A, and this sets in motion a chain of events that lead to Kate's death. Easily solved, then: take Mission A instead. What happens now, however, is that cousin Roman Bellic takes Kate's place. Roman is murdered in the exact same scene and in the exact same manner. From there, Niko's story turns out to be remarkably similar and imbued with the same measure of grief as if Kate had died. Nothing really changes and Niko feels just as bad. What meaning can Roman's death possibly have if it's functionally interchangeable with Kate's? Is this an indicator of the inescapable karmic retribution that Niko has coming to him? 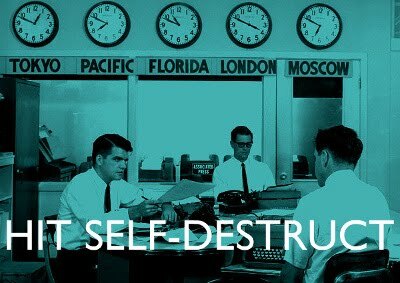 Maybe it's a sobering lesson about the consequences of messing with the time stream. Obviously it's neither. When Niko is before this crossroads, Kate and Roman are pulling him in opposite directions. Roman wants him to take Mission A because it'll make Niko a wealthy man and help Roman provide for his new wife, thus bringing them both closer to the American dream. Kate urges Niko against that same mission because it would compromise his principles. Whichever mission Niko picks, he'll gain favour with a certain character over the other and then watch them die. What's happening here, really, what this rare moment of narrative branching is all about, is polling the player as to which character they feel more strongly about so they can be killed for the maximum emotional effect. A random spray of gunfire just so happens to kill the person the player recently indicated that they cared about more. It's a choice rendered meaningless. The identity of the murder victim might not be predetermined but the future is set either way: whatever happens, the player will arrive at a moment where they're supposed ot feel sad and aggrieved. What appeared to be human tragedy is really total calculation. If Niko was searching for the meaning in Kate's death -- well, there it is, precisely. Kate and Roman aren't people, but robots built by Tragedy Systems. 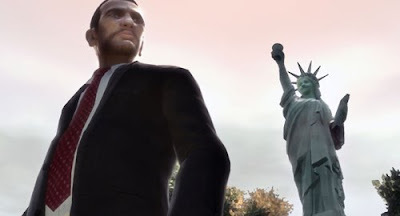 Grand Theft Auto IV tells its story through a linear and non-interactive instance that is separate from a wide, unguided sandbox. Essentially, it's like a movie stapled to a video game. Unsurprisingly this is not an airtight approach. The player has sporadic moments of agency in what is otherwise an extremely controlled and authored story. Every moment is the choice whether to kill a character or not, or kill one character over another. Some of these deaths, when they concern relatively important characters, certainly seem like they should have more of an impact than they actually do. Your choice of who lives and who dies creates an alternate reality, but that choice was carefully set up so that the outcome would only be marginally different no matter what you pick. Some dialogue is altered but it's all essentially the same. When you kill one of the McReary brothers, Kate and Packie McReary will refer to their dead "brother" as often as possible without ever mentioning his name, and the McReary you let live barely shows up again. The game doesn't actually have the bandwidth to support and maintain alternate realities. It can't sustain the level of fidelity and production that it wants if it's going to be truly reactive to the player's choices. No matter which mission you take and at which time, you always begin and end in the same place. No matter whether Kate or Roman dies, it all ends up the same. And if that was always going to be the case you wonder what was the point of ever pretending that the player could influence the story otherwise. The power of the story is diminished when every consequence is marginalized and ignored for practical reasons. Rockstar's carefully crafted and strictly controlled mobster epic becomes a soap opera where it isn't important to the story whether or not two major characters live or die. When you see your input briefly recognised and then whitewashed, all it does is highlight the limitations. The story of Grand Theft Auto IV is like a robot that rapidly dismantles and assimilates your choices into the pre-written and unchanging framework. The human player is granted, in this virtual world, effective immortality and time-traveling ability. Video games train players to think like this. Setbacks and deaths do not matter because you can rewind the clock in search for the path through the game most to your liking. You're looking for efficiencies, but this time, so is the machine, and you can't beat it at its own game. More so, the game underestimates your feeling towards the characters you got to "choose" from (Roman and Kate). While I do think that Rockstar evokes a rather subtle feeling of brotherhood and family in your relation to Roman, Kate never got sympathetic. You can take her out a hundred times (Bowling, Billard, Bar, whatever) you never got to build a relationship to her. "Relationship" is restricted to dialogues she and Nico are allowed to have in the car while driving to a certain place. When arriving at this place, GTA4 simply reduces to another mini game. Quite unsatisfying as a metaphor for a growing relationship, isn't it? My guess is that the emotional response of the player to the death of a character could be just as strong as in a movie if game creators would treat relationships just as serious as movie directors. Even more so if the player would have been allowed to build the relationship to the character for himself. Thomas: I agree it would have been interesting to see Niko in an actual relationship with Kate or any of the women in the game. I actually would expect that to end up as an element in a future GTA game. It was limited, sure, but I think that the conversations Niko and Kate had were enough to make her an interesting character to me. Not like a convincing love interest, but someone I was a little sad to see die. Not heartbroken or anything -- more irritated, I guess, like, why did that have to happen? Really liked your post. You sum up neatly a lot of the problems with games (like GTA IV) that always like to keep up the pretence that you have unlimited agency. You're a genius. This is deep, a good read. I wrote something similar about GTA4 myself, but that was just about how Marnie is the only random ped Niko doesn't help, and how she's the only one who ends up leaving the city and living happily. Having been vexed by the way games have traditionally dealt with death myself (to the point of writing several blog posts and one verbose journal article), I really appreciate this essay. i've often felt like killing off the supporting cast might have narrative potential in a game, but I haven't really seen it done effectively in many games just because, as you say, the characters are empty robots. Anyway, I'm really interested to see whether Heavy Rain — which promises to treat death as an actual development in the story — sets a trend or simply comes to be known as a weird exception.